Apple officially sent out invitations Monday for its expected Jan. 27 event in San Francisco, where it is anticipated the company will introduce its new touchscreen tablet device. According to Engadget the invitation was sent out Monday with the tagline: "Come see our latest creation." 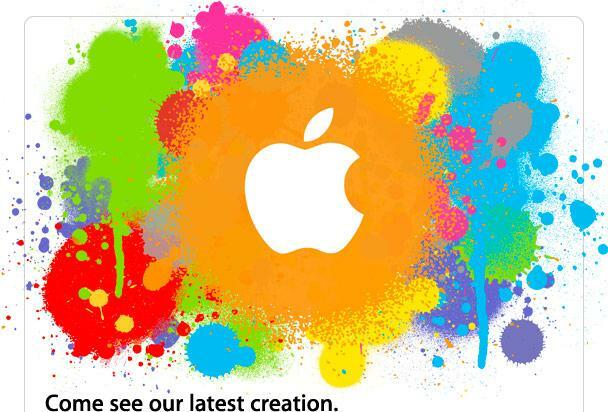 The included graphic has the Apple logo surrounded by colorful paint splatters. The event is scheduled for 10:00 a.m. Pacific time. Earlier this month, Digital Daily first reported the final Wednesday, Jan. 27 date. The event will be held at the Yerba Buena Center for the Arts. That followed an earlier report that Apple had booked the stage at the center for multiple days that week. Apple is expected to make a major product announcement at the event, which most believe will be its long-rumored tablet device, confirming a story first reported here in 2007. In addition, last July, AppleInsider first reported that the multi-touch, 10-inch successor to the Newton would arrive in early 2010. In December, select iPhone developers were allegedly asked to prepare full-screen demos of their software for a product unveiling. It has been suggested that developers are working with a new version of the iPhone OS that allows software to be scaled to multiple screen sizes. Various reports, including one from The Wall Street Journal, have said that though next week's event will serve as an official unveiling of the tablet, it will not be made available for sale until later this year. Sources have said that date would likely be around March.